​Buried green anemones in the sandy intertidal zone around Calvert Island. Photos by Kelly Fretwell (top), Nathaniel Glickman (bottom left), Maria Shallard (bottom centre), and an ES 470 participant. Besides having a buried column, this anemone's main identifying feature is its long, slim tentacles that are often banded with white. Its colour varies from greyish green to brown or black, though sometimes it has pink or orange tentacles, or a pink or orange oral disc.. The column is pink or white on the buried lower portion, and greenish or brownish on the very top exposed section. The greenish or brownish colouring of the oral disc, tentacles, and top of the column is due to symbiotic algae that live in the exposed, visible tissue. The buried green anemone is solitary, and can reach 10 cm in diameter with a buried column to 25 cm long. True to its name, this species can be found buried in a mixed sandy, shelled, and cobbled ocean floor, with only its tentacles and oral disc exposed. Underneath the mix of sand and broken shel,ls its base is attached to something solid like a rock or a large shell. It lives in the intertidal zone and shallow subtidal, to a depth of 10.5 m. While it will live on open exposed coastlines, it prefers sheltered bays. 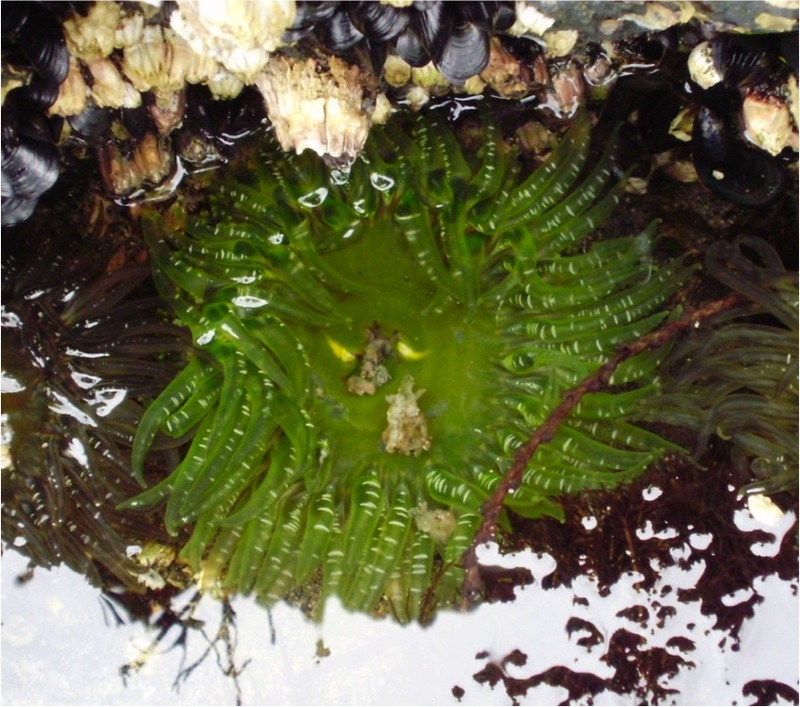 The buried green anemone occurs on shorelines along the west coast of North America from Alaska to southern California. 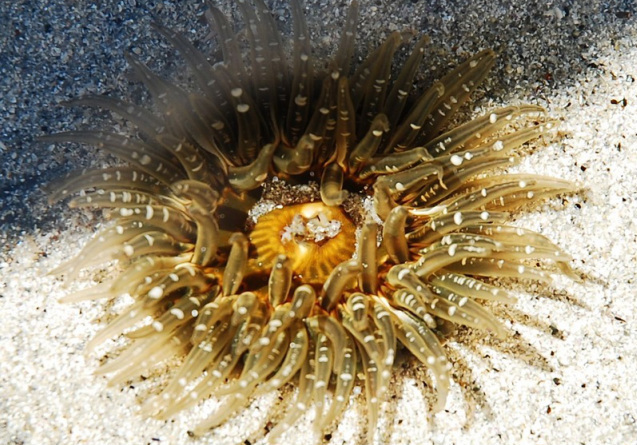 This is the only anemone found on the Central Coast that has the greenish-brown colour from symbiotic algae, long slender tentacles, and is partially buried beneath sand. The aggregate green anemone (Anthopleura elegantissima) and the giant green anemone (A. xanthogrammica), which usually have similar colouring, only get minimally buried in sand if ever. As well, the latter is generally larger and has shorter, unbanded tentacles, while the former is colonial, smaller, and has distinct pink-tipped tentacles. The stubby rose anemone (Urticina clandestina) is also found partially buried in sand and can have similar colouring to some buried green anemones, but has short and blunt tentacles. 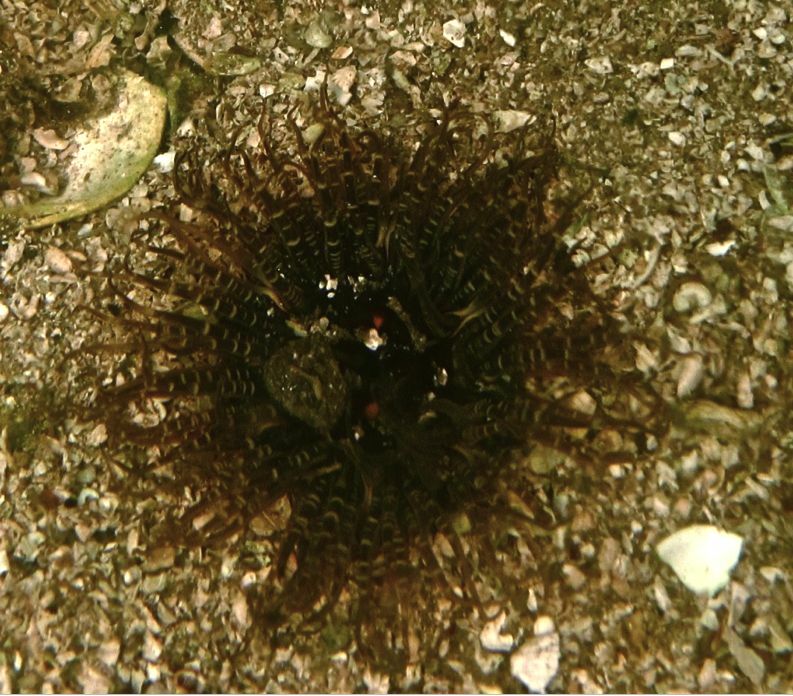 Buried anemones are sometimes found in holes bored by clams. At low tide they may not be visible above the surface, but instead their presence is marked by a bump or puckered hole in the sand. 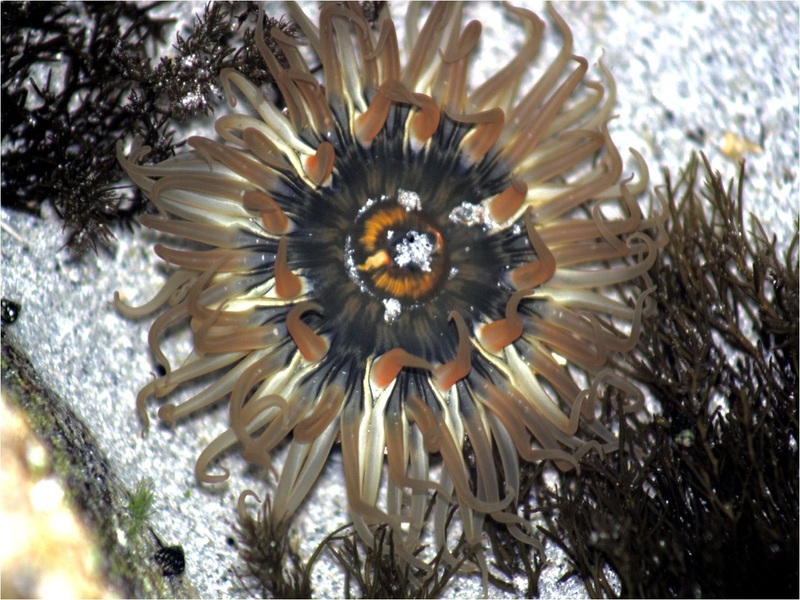 They have special white tentacles lining the oral disc which they use to attack other anemones that invade their space. Cowles, D. (2005). Anthopleura artemisia (Pickering in Dana, 1848). Invertebrates of the Salish Sea. Rosario Beach Marine Laboratory. Accessed 31/07/2013. Lamb, A., and Hanby, B. (2005). Marine Life of the Pacific Northwest. Madeira Park, BC: Harbour Publishing. P. 85.